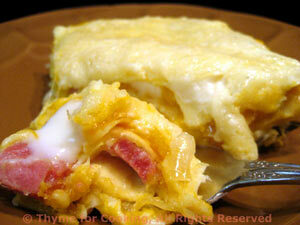 Easy Dinner from Thyme for Cooking: Pumpkin Lasagne with Ham and Sage. You can use canned pumpkin for this, or any other winter squash (including pumpkin) that has been cooked and mashed. I use fresh pumpkin from my garden, that I roast, package and freeze. For directions see Pumpkin. Any leftover lasagne and extra pumpkin can be frozen for later. Pumpkin is not just for pies. It's a wonderful vegetable, and works well in a lot of savory dishes. I use moist, deli ham in this lasagne. I love the combination of ham, sage and winter squash. You can leave the ham out for a vegetarian version. The recipe was designed for using no-cook noodles. Thinly slice the onion and leeks. Heat oil and butter in large nonstick skillet over medium high heat. Add onions, leeks and sauté, stirring, for 1 minute. Cover the pan, reduce heat to medium low and cook for 10 minutes. Uncover, increase heat to medium, continue to cook until onions are golden and tender, about 10 minutes longer. Add the pumpkin, stir well to combine and heat through. Cut the ham into thin strips, then the strips into smaller squares. In another skillet heat 1 tsp butter. Add sage leaves and sauté until starting to get crisp. Add ham, sauté until heated through and dry (it can give off a bit of water). In a medium saucepan heat 3 tbs butter over low heat. Add flour, nutmeg and stir with a whisk for 1 minute. Add a little (1/4 cup) of the milk, whisk to combine. When all of the milk is in, bring to a boil (should almost be there), whisking. Then remove from heat. Cover and bake 425F (215C) for 20 minutes, or until noodles are done. Test in center with a sharp knife. One of the easiest and best desserts of fall. The scent of apples baking with cinnamon brings back childhood memories of raking leaves and apple picking. Warm from the oven is perfect, with or without some vanilla ice cream or yogurt. 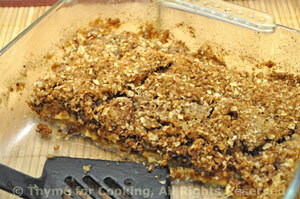 Leftover apple crisp should be covered and can, but does not have to be, refrigerated. It will keep for several days and we have plans for it. Butter and 8 X 8" (20 X 20cm) square baking dish. Peel and slice apples and spread in baking dish. Mix sugar, spices, flour and oats. Cut in butter, using a pastry cutter, 2 knives or forks, until it resembles small pebbles. Bake 30 minutes at 375F (185C), until top is bubbly. Note: We're adjusting the oven temp to accommodate the lasagne - see instructions below.